The afghan commemorates Cascade Yarns® 30th anniversary. The 30 squares will be released throughout 2017 as part of the mystery knit-along. Cascade Yarns® will be making a donation to different fiber-related charities equal to the amount that it receives from Ravelry for the sale of these patterns. 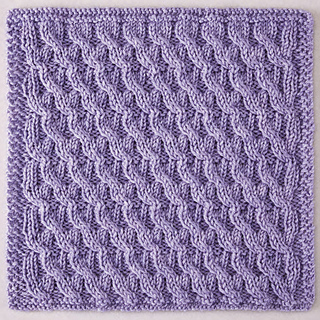 A sea of wavy cables wind their way across this lovely lavender block. 26 sts x 30 rows = 4” (10 cm) in Cross Rib Stitch (blocked). For extra help, here is Cascade Yarns Project page!